Map out the morning routine. Discuss how the mornings will work, from wake-up times to setting out clothes the night before to whether your child will be making lunch or buying it at school, etc. Do a practice run—show them how long it takes to walk to the bus stop, or drive to school so they are prepared the first day. Early to bed. Kids need 9-11 hours of sleep every night, depending on age. Once you know how early they need to be up, plan a regular bedtime and start sticking to now so the first week of school is easier. Healthy food fuels the body and mind. Let your kids help you shop for healthy foods they enjoy and encourage them to start the day with a good breakfast, especially one containing some healthy protein. Prepare a “homework space.” Clear out a designated area, complete with supplies of pencils, markers, tape, etc. so your child has space to work. Depending on his or her age, you may want to make this space in a common area of the house so you can be available to help with homework. Be a bit empathetic. Adjusting to a new school, trying to make friends, dealing with a heavier work load—all of this can be very stressful for kids. 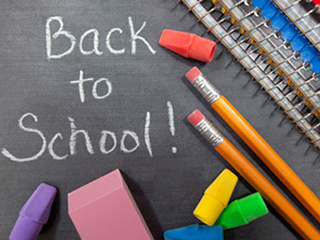 Try to be a support during these first few weeks of transition back to school.